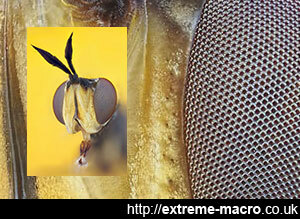 A macro robberfly, a popular insect with extreme macro photographers. 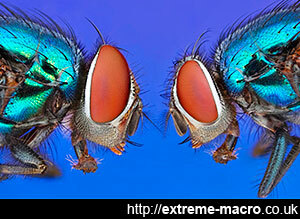 An unusual macro photograph of two greenbottle flies shot together. Focus stacked macro image of a hoverfly, using a portrait-like 3/4 view. 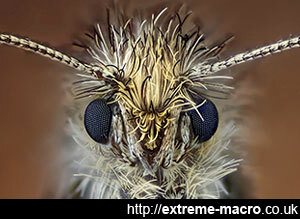 A macro shot of a very micro moth, complete with extraordinary punkster hairstyle. 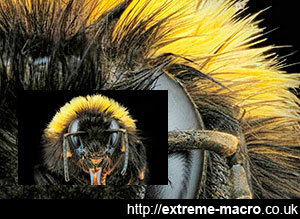 The magnificent golden mane of a queen bumblebee. 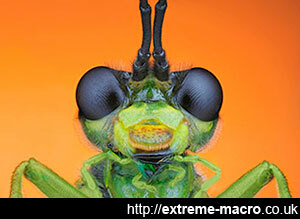 An extreme macro focus stack of a Sawfly, the bane of the nation's gardeners. 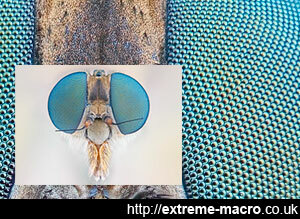 An extreme macro gallery restricted to macro shots of insects at present, but will cover other extreme macro subjects in due course. All images here are by Johan J.Ingles-Le Nobel, © 2009-2019. I have to tell you how much I appreciate your website. Having retired I now have the time to devote to the hobby. Your site is a breath of fresh air that macro can be achieved by the common man...Using the various techniques you have published I have already seen marked improvement with just my old 40D and an old (but very pristine) Takumar 28mm (reversed). And the importance of your advice regarding note taking cannot be over emphasized. Thanks so much for sharing this valuable knowledge.